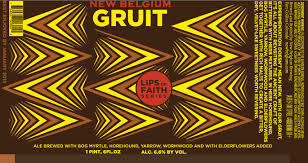 Gruit Ale is the latest Lips of Faith release and uses an ancient brewing style of incorporating herb mixtures into beer. This ale is brewed with pale and Munich malts, along with wheat and oats. Other ingredients include Bog Myrtle, Horehound, Yarrow, Wormwood and Elderflower, making for an herbal, almost mint-like and floral bouquet with a bittered root taste. The flavor is bold, with the botanicals playing a big role. Gruit is 6.6% ABV. With the groundbreaking of the Asheville, N.C. facility just a few short months away, New Belgium Brewing is celebrating the second Mothership coming to life by teaming up with Asheville’s own artisan maltster, Riverbend Malt House. The two collaborated on New Belgium’s latest Hop Kitchen release, RyePA. The India Pale Ale, which is brewed with Carolina RyeTM and malted by Riverbend, boasts a bold blend of Simcoe, Galaxy, Cascade, and Mosaic hops, giving it some spicy notes and aromas. RyePA comes in at 75 IBUs and 7.5% ABV. To read more about the backstory behind RyePA visit – http://www.newbelgium.com/Community/Blog/14-02-24/Matty-Smooth-on-RyePA.aspx. Sounds great, who you going to Colorado with?